More than any device in recent memory, the Panasonic Lumix DMC-GF2 is a showpiece for the benefits and drawbacks of a touchscreen interface. Although the camera's touchscreen UI introduces a few groundbreaking features to the compact interchangeable-lens camera category, it may leave you longing for old-fashioned analog controls more often than not. At heart, the Lumix DMC-GF2 ($700 as a kit with an optically stabilized 14-42mm/F3.5-5.6 lens or a 14mm/F2.5 prime lens; price as of May 16, 2011) is a souped-up successor to the groundbreaking Panasonic Lumix DMC-GF1. The GF2 improves on the GF1's basic specs with a smaller, more streamlined body; higher-resolution, 1920-by-1080 60i video recording; higher ISO sensitivity (ISO 6400 versus ISO 3200); and compatibility with Panasonic's optional 3D conversion lens. The most noticeable new feature in the GF2 is its 3-inch touchscreen, which provides significant benefits while you're shooting stills and video. Namely, it lets you use touch-to-focus controls like the ones you'll find on many smartphones--a powerful, versatile feature in a camera with the GF2's bigger sensor and swappable lenses. The camera's touchscreen interface is also customizable, so you can touch-access your favorite settings quickly, and the camera's aesthetic design is clean and uncluttered due to the lack of physical controls. But the 3-inch touchscreen is also where this camera's problems start. A touchscreen simply isn't an effective substitute for some physical controls--most notably a mode dial--and menu navigation via the touchscreen can make you perform a lot of screen presses, smudging up the only native viewfinder the camera has as you go. You don't need to use the touchscreen for everything; if you don't use it, however, you still have to navigate a lot of menus via the camera's directional pad to access some important settings. The result is a good camera, but a frustrating one. To please novice users, the Panasonic Lumix DMC-GF2 tries to do a bit too much with its touchscreen, which ultimately hampers its usability for seasoned shooters. The GF2 is still a phenomenal step-up camera for anyone who is seeking to trade in a point-and-shoot for interchangeable-lens power, but manual-minded photographers will be slowed down by the GF2's touchscreen interface. 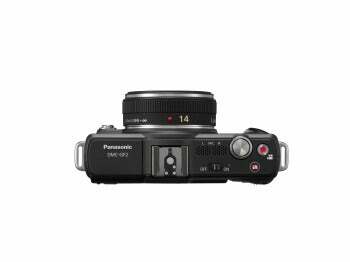 The 12-megapixel Panasonic Lumix DMC-GF2 is certainly small for an interchangeable-lens camera, as its body (without a lens attached) measures just 1.29 inches deep, 4.44 inches wide, and 2.67 inches tall. Not only is it smaller on every dimension than the Lumix GF1, but it's also skinnier than the interchangeable-lens Sony Alpha NEX-5 (1.56 inches deep, 4.38 inches wide, 2.38 inches tall) and even more compact than some point-and-shoot cameras, such as the Canon PowerShot G12 (1.9 inches deep, 4.4 inches wide, 3.00 inches tall). Like many recent Panasonic cameras, the GF2 offers extremely fast autofocus, which you really need to see to believe. As long as a subject is at least a few inches away from the lens, the autofocus system is lightning-fast and rarely fooled--and if it is fooled, you have the option of touching the screen to focus wherever you want. In addition to a manual focus mode, you'll find a 23-area focus system, continuous autofocus in video mode, motion-tracking autofocus, and the ability to transition between focus points while you're filming video. When it comes to focus options, the little GF2 crushes the vast majority of full-size DSLRs. It's also a very solidly built, aesthetically pleasing camera, with a slightly more modern look than that of the GF1 thanks to its redesigned, swoopy handgrip. Despite its diminutive size, the Lumix GF2 manages to pack in a pop-up flash, which you can manually tilt (and hold) upward to use as a makeshift bounce flash. The GF2 also offers a hot shoe that accepts proprietary flashes, an optional eye-level viewfinder, and external microphones. A few of the GF1's physical controls have been moved to the touchscreen menus. The top of the GF2 has neither a mode dial nor a toggle switch for burst shooting or bracketing modes; on the back of the camera, you'll find neither a dedicated toggle button for autofocus/manual focus nor a button to lock focus or exposure. You do have the option of assigning the GF2's 'Quick Menu' button as a Function control that locks focus and exposure; the GF2's directional pad offers access to continuous shooting mode, too. However, not having dedicated buttons and dials for so many settings adds up when you're using this camera extensively. You have to adjust all those settings by navigating the menus in different ways: by tapping icons on the touchscreen, navigating the on-screen selections via the camera's four-way directional pad, or a combination of the two. The GF2 has a few button-based shortcuts. On the top is an iA (Intelligent Auto) button, which gives you direct access to the camera's auto mode; you also get a physical shutter button, a dedicated video record button, and a power switch. The iA button works as a toggle: Pressing it once brings you to auto mode, and pressing it again jumps back to whatever manual settings you were using before. The back of the camera is very clean around the 3-inch touchscreen, with just a button for popping up the flash, a click/scroll wheel for dialing in aperture values and other settings, a playback button, a programmable 'Quick Menu/Function' button for accessing user-defined controls on the fly, and a four-way directional pad that doubles as one-press access to ISO, white balance, focus controls, and burst mode. Like all of Panasonic's Micro Four Thirds System cameras, the GF2 has a crop factor/focal length multiplier of 2x, meaning that the kit zoom lens has an effective zoom range of 28mm to 84mm in 35mm film equivalent. Even without a dedicated macro lens, macro performance is surprisingly good with the 14-42mm kit lens, especially when you dial in a focal length of about 50mm, buffer or bounce the flash, and compose your shot from there. The Panasonic Lumix DMC-GF2 offers RAW and RAW+JPEG capture modes, as well as a burst mode that captures 3.2 images per second at full 12-megapixel resolution. When shooting JPG photos, you can record images in burst mode until your SD Card fills up; in RAW, you're limited to seven shots in a row. The GF2 performs surprisingly well at high ISO levels, as both image sharpness and noise aren't much of an issue until you get beyond ISO 1600. You notice quite a bit of grain at ISO 3200 and 6400; but even at those high ISO levels, color accuracy is impressive. See the test shots we took at ISO 200, ISO 400, ISO 800, ISO 1600, ISO 3200, and ISO 6400 with the GF2. In PCWorld Labs subjective tests for image and video quality, the Panasonic Lumix DMC-GF2 exhibited the same tendency to underexpose images in Intelligent Auto mode as other recent Panasonic Lumix cameras did. The camera's Auto mode produces muted images and gravitates toward grayer whites than we'd like. Using manual exposure controls, the camera jumps to the other end of the exposure spectrum, as colors and whites tend to look oversaturated and blown out. Overall, using a combination of auto-exposed and manually exposed test shots, the GF2 earned an imaging score of Fair. We rated its color accuracy as Fair and its exposure quality as Fair; on image sharpness the GF2 earned a score of Good, and on lack of distortion it turned in a score of Fair. As with many Panasonic cameras, image quality gets drastically better when you use the GF2's manual settings, which makes it all the more frustrating that they're not particularly easy to access. As for shooting movies, the GF2 produced decent-looking 1920-by-1080 AVCHD video in our subjective tests, with smooth motion and bright, vivid colors. The white background in our bright-light test clip looked a bit blown out, however, and the camera's autofocus searched a bit at the beginning of our clip. In low light, the GF2 was a less-impressive video performer. It's also important to note that the GF2 lacks the full manual controls for video that you'll find in the higher-end Lumix GH2 and the point-and-shoot Lumix LX5. However, the camera's touch-to-focus controls and its array of automated metering, continuous focus, and wind-blocking microphone controls add to its standout video capabilities. You can view the test videos we used for our subjective tests below. Select 1080p from the drop-down menu in each player to see the highest-resolution video footage. The Panasonic Lumix DMC-GF2's touchscreen is an innovative and indispensable instrument in one particular area: focus controls. Autofocus on this camera is very fast, and the ability to touch an area of the screen and have the camera lock focus and snap a shot within a fraction of a second is a major plus. The touch-focus controls are especially outstanding in video mode, as you can jump between focus points while recording merely by touching different parts of the screen. Put simply, no other camera in the GF2's class can do that, and it's a huge draw for anyone who wants to shoot video with this camera. Where the touchscreen stumbles is in performing somewhat basic tasks. Due to the camera's lack of a mode dial, you access the GF2's shooting modes by pressing the menu button in the center of the camera's directional pad, selecting one of the eight options (Program, Aperture Priority, Shutter Priority, Manual, iA, Color Filters, Scenes, or user-defined Custom settings) via the touchscreen or the directional pad, and then adjusting exposure controls via either the touchscreen or the camera's back-mounted scrollwheel. Although that doesn't sound like much of a hassle, most on-the-fly adjustments require you to use both hands and/or reframe your shot. And due to the wealth of touchscreen controls and programmable buttons, it's easy to get lost in this camera. While the top-left corner of the screen displays which shooting mode is currently active (P, A, S, M, and scene modes), nothing beats clearly marked analog dials and buttons when it comes to knowing what the camera is up to. What's more, the touchscreen is always active while the camera is on, which means that if you have the touch-shutter function turned on, you'll almost always take a few accidental shots while you're putting on the lens cap or trying to wipe off the screen. The larger Panasonic Lumix DMC-GH2 also employs touchscreen controls, but in a much more successful way. What makes using the GF2 radically different is that the touchscreen is the only game in town for many of the controls; you can also use the directional pad to access many settings, but it still adds steps to the process. Unlike the GH2, the GF2 doesn't give you the option of using traditional, physical buttons for the camera's core features. Long story short: After using this camera for an extended period of time, I missed having a mode dial and dedicated buttons, even though the touchscreen is unparalleled in focusing tricks. The Panasonic Lumix DMC-GF2 is a good camera, with fast autofocus, useful touch-focus controls for stills and video, and an impressively small size for the performance it provides. Ultimately, however, it had me itching for a Lumix GF3, which I'm hoping will offer a return to more-traditional physical controls in addition to touchscreen-focusing options and improved performance in Auto mode. A combination of the GF2's touch-focus capabilities and the GF1's real buttons and dials would add up to a compact interchangeable-lens camera that pleases both casual and more-experienced shooters. As it stands, the GF2 leaves a few too many important controls to its touchscreen while abandoning the old-school knobs and buttons that would make it easier to shoot with. This story, "Panasonic Lumix DMC-GF2 Review: Leaving Too Much to the Touchscreen" was originally published by PCWorld. The Lumix GF2 is an enticingly compact interchangeable-lens camera, but its touchscreen interface is an inefficient way to access some important controls.